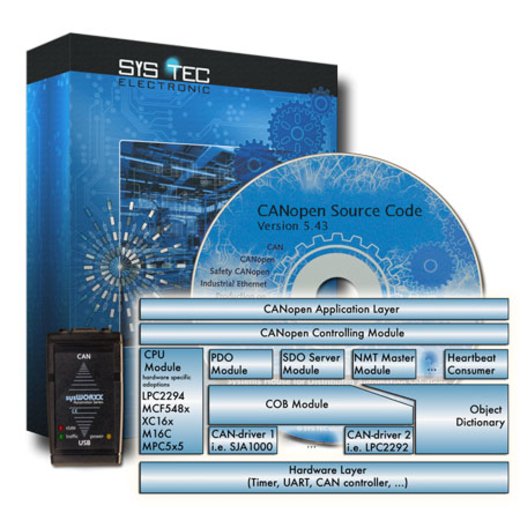 The SYS TEC electronic CANopen source code package includes the functionality needed to implement standard compliant CANopen master and slave as well as manager devices and applications. Besides the full set of CANopen slave services, the SYS TEC electronic CANopen source code also includes a set of commonly used CANopen master services, such as NMT master, SDO client or LSS master. Dedicated add-on packages for special applications, such as motion control or CANopen safety are available as well. The SYS TEC electronic CANopen source code structure is scalable and portable. Written entirely in ANSI-C, the source code allows for custom tailoring the stack to every application. The CANopen stacks can be used in target platforms with or without an underlying operation system. A straightforward, event-oriented signaling up to application level attains a high degree of performance and allows for short response times. The SYS TEC CANopen source code base is mature and has proven to be reliable in a huge number of industrial applications. As a development partner in the embedded automation field, our software is actively used and well-proven in a lot of customer projects. With purchasing the SYS TEC electronic CANopen source code, you get more than just a CANopen protocol software. We grant our users one full year of technical support and software maintenance. Our source code package includes a GUI tool to create the device Object Dictionary; including the corresponding EDS file. However, a CANopen device design doesn’t end with the software. After the firmware is done, it needs to be tested on the real-world hardware. To support our users in stage of device testing and integration, our CANopen comes with an USB/CAN interface and a complete set of CANopen configuration and analysis tools. Our goal is to provide you with a most convenient environment for development, integration and testing of your CANopen applications. Our CANopen source code has been adapted and used in a number of safety-related applications. A highly optimized version of our CANopen Safety source code is running on the CANopen Safety Chip CSC02. Our CiA 304 CANopen Safety add-on enables users to build own CANopen Safety applications. Based on the experience through several safety developments in the past, we can support you with various services in the development of safety applications. We can offer you for example: workshops, seminars and consulting in the CANopen safety field, preparation or evaluation of safety concepts, CANopen Communication Stacks, engineering and development services (hardware and software) as well as support in the approval and certification process. Sophisticated CANopen devices, such as PLCs or HMIs require more than basic communication services. Their task is to make sure that all devices on the network are available and correctly configured before starting the machine or process. Our CANopen Manager source code provides the functionality needed for implementation of sophisticated CiA 302 compliant manager devices. The CANopen Manager Source Code provides substantial extended functionality to implement powerful CANopen devices with managing functions compliant to CiA 302 and CiA 405. The integrated Configuration Manager holds the parameter sets of the assigned CANopen slave devices and handles the on-demand configuration of connected nodes during runtime. Furthermore the CANopen Manager Source Code allows for an easy integration to IEC 61131–3 runtime environments and therefore is prepared for development of CiA 405 compliant controllers. SYS TEC electronic also has an own high-efficient IEC 61131–3 PLC runtime system on hand, including the seamless integration of CANopen and Ethernet communication. A leading german manufacturer of lift controls uses the SYS TEC electronic CANopen Stack for the development of their new CiA 417 based control generation. It’s resulting in a multifunctional control system with universal interfaces. The SYS TEC electronics CiA 302 CANopen Manager Source Code as well as additional add-on modules for MPDO, NMT Flying master and CANopen Bootloader provided all the needed communication layer functionality and tools for implementing such a CiA 417 compliant CANopen devices. The use of our CANopen Protocol Stack allows the development of cost-effective servo control solutions with a short time to market. Including advanced communication functionalities, such as the CiA 402 device profile, these systems provides open interfaces and interoperability with other CANopen devices. The CiA 402 device profile can be easily implemented thanks to our CiA 402 Add-on package, which supports multi-axis coordination and different control modes. The add-on comes with additional plug-in for the CANopen DeviceExplorer to help test and commissioning of multi-axis CANopen devices. Modern distributed systems require easy means for updating the firmware and other embedded software components remotely. Our CANopen Bootloader provides all functions to deliver and update firmware via CAN bus using SDO transfer. The CANopen bootloader implements a minimal CiA 302 compliant CANopen node, especially optimized towards portability and small memory footprint. Designed for use in critical systems, the CANopen Bootloader provides additional means for reliable data transmission and ensures the system never ends up in an undefined state.